Yep, it was April 2nd and it was time to move again! Where to next? 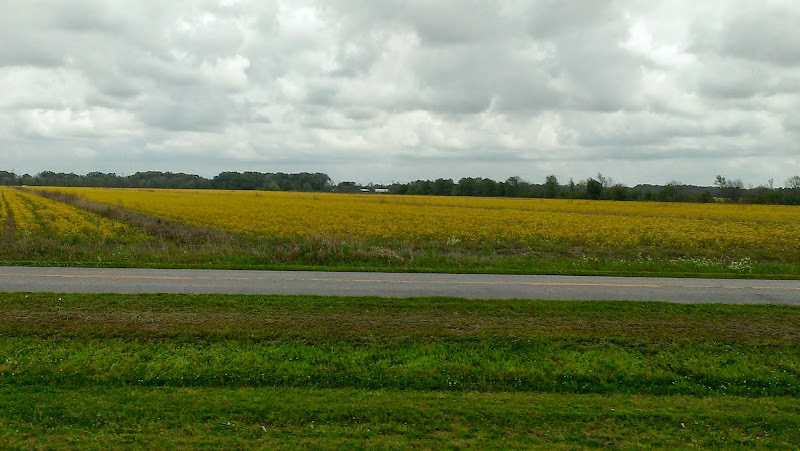 We wanted to explore more of Louisiana so we were headed about 2 hours west of Westwego to Charendon, LA where we had made reservations at the Cypress Bayou Casino RV Park. And whoa, it wasn’t rainy or stormy! Why another casino? Well we decided on the casino for three reasons, none of which has to do with a gambling obsession. Firstly, it was cheap, only $16/night weekdays and $22 Fri & Sat for a concrete pad full hookup site. Secondly, more traditional campgrounds tend to fill up with families on the weekends so we figured it might be quieter here at the casino – and it was. Thirdly, it was within a half hour of three of the local attractions we were interested in visiting. 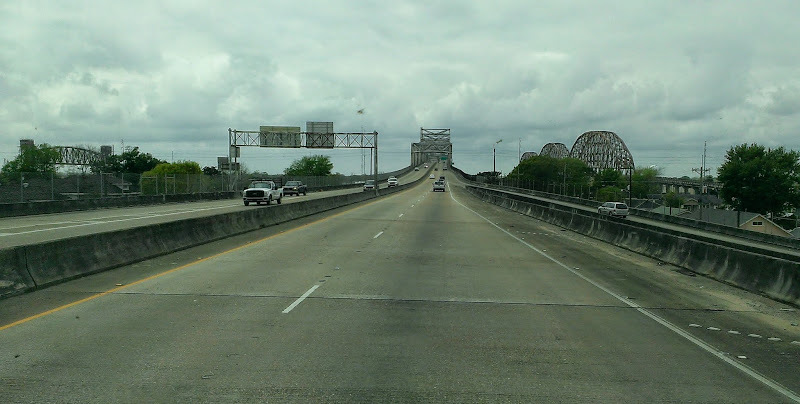 After exiting Bayou Segnette State Park, we headed out on Highway 90 which is a four lane divided highway and by the looks of it we expected a pleasant drive. Well looks can be deceiving! Before I go any further I have to say that many Louisiana roads leave a lot to be desired, Highway 90 in particular! The construction of most roads in LA is concrete slab, most are in good shape with minimal cracks, but the problem is the wide and uneven expansion joints every 20 feet or so. The driving isn’t peaceful at all! On most concrete roadways we’ve experienced, the expansion joints are mostly even and you hear a faint ka-tic, ka-tic, ka-tic… as the tires cross the joints and there is minimal bumpiness. On many of the roads here in LA it’s ka-THUNK, ka-THUNK, ka-THUNK interspersed with a fair amount of ka-SLAM’s, plus some radical motion to go along with it. Rob said he felt like his dental fillings were gonna come loose! UGH! I’m getting a headache just thinking about it! And if that weren’t bad enough, the pavement has dips and swells in many spots (particularly bridges) causing some porpoising motion in the beast. Yes, we have a land yacht but we’re not used to so many swells and waves on the road! On the bright side, a minor problem we were having with the See-Level gauge sensors for our grey water tank cleared up – guess all the bumps shook loose whatever debris was causing the issue! 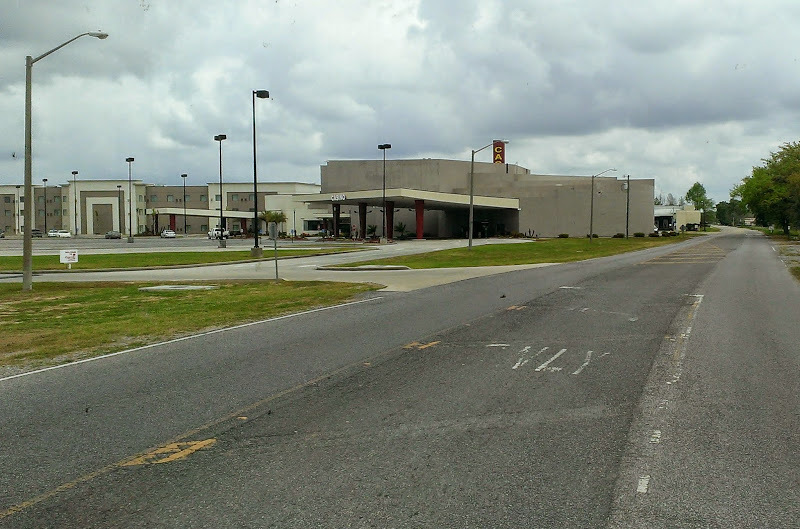 Anyway, we eventually took the exit to LA-83, then a right onto Main Street followed by a left onto Charendon Road and then onto Chitimacha Trail, arriving a little bit after 1:00 pm. Our tortuous drive this day was finally over. And by the way most of the side roads are just as bad as Hwy 90 was! 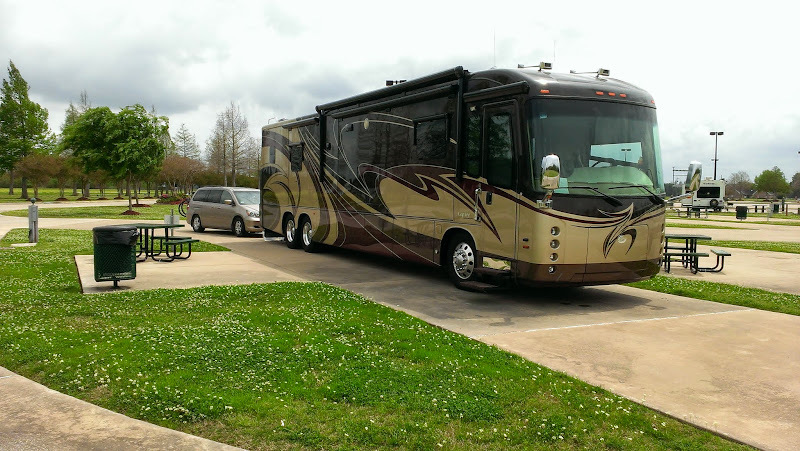 When I made a reservation at Cypress Bayou Casino, I was told that we would need to check in at the hotel before proceeding to the RV park. As we pulled into the hotel parking lot, I was surprised that there were hardly any cars in front of the hotel or the casino. The casino exterior definitely lacked the bling of Hollywood Casino is Bay St. Louis, MS. Maybe that was because casinos were everywhere here in LA. In other states, gas stations or truck stops often have the typical convenience store, but here most have a small casino too. However, as we headed towards the campground, it became obvious that where we had parked to check in near the hotel entrance was actually the back side of the casino. There were lots more cars in the parking lot on the other side. 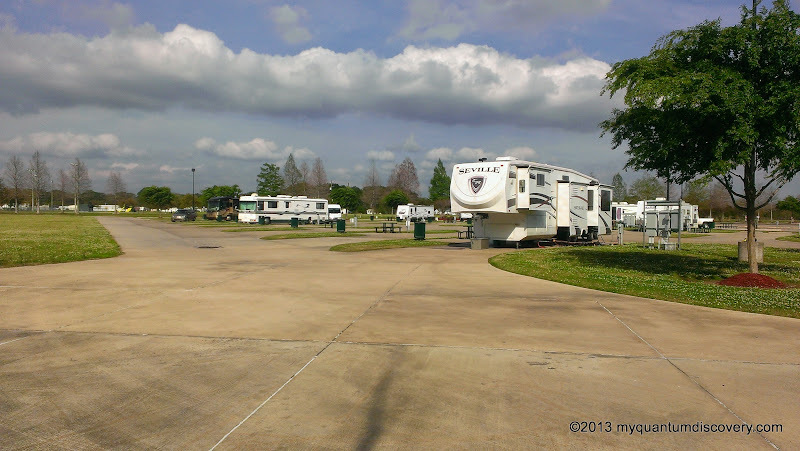 Cypress Bayou Casino RV Park has 30 full hook up sites (water, electric with 20/30/50 amp service and sewer) with free shuttle service to the casino, free cable hookups and 24 hour surveillance. The campground is located at the furthest point from the casino way at the back of an overflow parking area, so it is unlikely to see any casino parking or traffic. On the weekend there were some employees parking nearby however, but that was never a problem or concern. A third of the sites here (#22-30) are long concrete pad pull-thru’s facing away from the casino and toward a grassy field – we would recommend one of those. Sites #12-21 are concrete pad back in’s and you face the sites above. Sites #1-11 are actually part of the asphalt parking lot and face opposite the other two rows toward the casino and across the parking lot – in our view these would be the least desirable. To get here we recommend navigating to these coordinates (change the view to satellite to get a nice view of the campground layout) and using the driveway at this location to enter/exit the campground with your rig – the other driveway further south and west has trees lining both sides and while the trees are still young, there might be a few branches waiting there to scratch your pretty paint. Also note, as previously mentioned the management is now taking reservations for specific site numbers, so despite what you may have read elsewhere, you must check-in with the hotel desk first before proceeding to the campground. 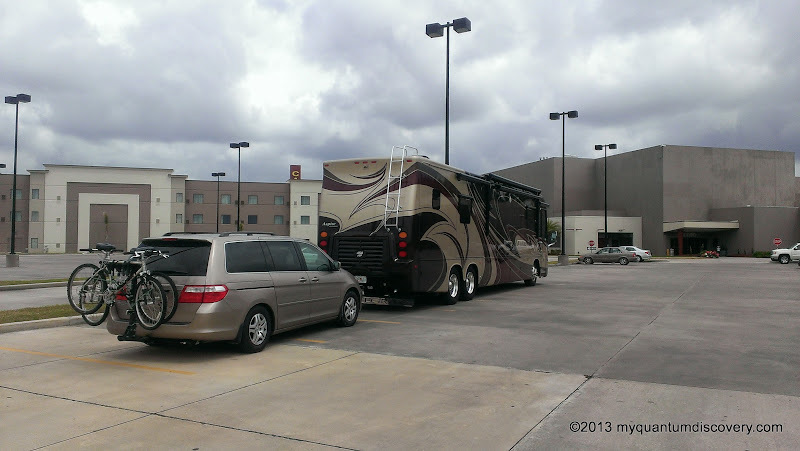 You will pass by the hotel on the way to the campground and there is a big lot there with plenty of room to maneuver. Our site (#28) was a pull-thru and comfortably long so there was plenty of length even with the van still attached. Each of the concrete pad sites comes with a metal 4-sided picnic table and the hookups were well placed for a motorhome. The sites in the concrete pad section also had decent space and some grass between them. Although, with our slides out it felt like we were fairly close to the adjacent picnic table, but that was okay since no one occupied that site while we were there and with the weather we had, it is doubtful anyone would have used it anyway. No big trees nearby so satellite reception was not a problem. OTA TV and Verizon LTE were adequate. All in all a fairly comfortable and inexpensive place to spend a few days exploring the area. We didn’t do much for the rest of the day, I probably worked on blog posts (I’m so far behind) while Rob worked on the taxes. We’ll tell you about our sightseeing excursions in our next post. I am so sorry about the road conditions but they put my power boat in the water Tuesday and we had snow Tuesday evening! I win (or lose)!! We experienced some of those same kinds of roads in northern Florida and South Carolina. It was exhausting! You are in an area of the country we are thinking of spending some time in next winter/spring. We lived in Biloxi MS for 14 months when John was in the Air Force.